Maria Andersen blogged and tweeted about an Equation Challenge — asking people to type out a set of 15 math questions and asking them to record it. I know Maria is a big fan of MathType, and wants people to learn to unlock the secrets of it that make it so powerful. 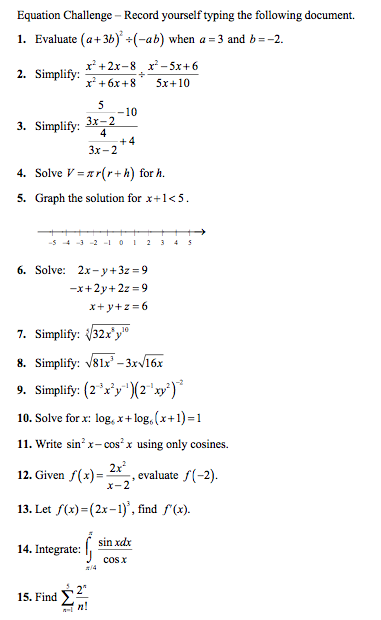 I use MathType when I’m at school — I type all my worksheets and assessments up in Microsoft Word. (I type all my Multivariable Calculus problem sets out in LaTeX, however.) But when I was in high school (ahem, at… ummm… yeah, you got me… math camp), I first learned about LaTeX. It has a slightly steep learning curve — definitely MUCH steeper than MathType — but I find that since I’ve been using it for so long, it has become really naturalized. And you know what? MathType can actually take in LaTeX (if you select that option in preferences). So I get the best of both worlds when I’m using Word. So for the heck of it, I took Maria’s Equation challenge twice. Once, using Lyx (my LaTeX editor). Once, using Word. I was curious to see if I was faster with either of them. Of course I typed it as I normally would — using both the GUI and LaTeX. The documents I produced are here (LaTeX) and here (Word). The result: I’m about equivalent in both. Which isn’t so surprising, considering I use LaTeX to type both. I’m a big Mathematica fan. I write just about all my assessments/worksheets/handouts in it. In my opinion, it looks prettier than MathType, and about as pretty as LaTeX. Also, when you learn the keyboard shortcuts, you can type everything you need–no mouse-clicking necessary–which makes everything go faster. 8 minutes and 43 seconds using MathType and Microsoft Word. It’s all I know and all I’ve ever used. Sam, I’m glad you took the challenge. Maria first posted the challenge several months ago, and as far as I know, no one took her up on it until today. I know of you and Robert. I would like to correct several instances of a glaring error in your post above — Maria uses MathType, not Equation Editor, as you stated at least 4 times. Another error — Equation Editor will not “take in LaTeX”. MathType will do so — and quite well. Thanks. Fixed. I tend to conflate the two, but they are not the same. Wikipedia punts this one. Looks like the combination of an attempt at a real world analogy of a steep hill, and lots of non-math people in the social sciences, have left this a mess. I think most people interpret “steep learning curve” to mean effort vs knowledge / progress. A little googling makes clear that there’s no “most people” here – the phrase has currency with two completely opposite meanings. Ugh. should get you pretty close to the desired number line. Presumably, there is a much faster way to do this, but I’ve never had much luck reading through manuals. From this, it should be pretty easy to write a macro for number lines.